Typically, when an inventory scan discovers the same product through the Fingerprint process and the Add/Remove Programs (ARP) list, the Inventory Collector reconciles the products into one entry in the inventory report. However, the reconciliation can fail if any of the following pieces of information are not identical for the two product entries: manufacturer name, product name, or version.Failed reconciliation results in two discovered products being created, one for each of the two product entries in the inventory report. In order to ensure correct license management of the product, you should manually reconcile the two discovered products into one. This also reconciles the two product entries into one in the inventory report. Scan at least one device to identify the ARP listed products and FP products that are not reconciled. Ensure that you have sufficient rights to modify Inventory and Asset Management rights. Check and compare the product name, manufacturer, and version information of the ARP and FP products you plan to reconcile, to ensure that you do not reconcile the wrong products. In ZENworks Control Center, click Asset Management. On the License Management page, click Discovered Products. Select the product (primary) that you want to reconcile. Click Action > Reconcile Products, then click OK to continue. In the Selection dialog box, select the discovered product (secondary) to be reconciled with the primary product, then click OK. If you have selected a Fingerprinted (FP) product as the primary product to reconcile, only ARP products are available to select as the secondary product, and vice versa. After the manual reconciliation, all references to the secondary discovered product are removed from the ZENworks Asset Management database. At this point, you can filter the reconciled products by using the Install Status filter criteria. Only one instance of the reconciled software product appears in the inventory report. Only one instance of the reconciled software product appears in the Discovered Productslist. The secondary product is no longer displayed in the Discovered Products list or in the device's inventory report. Locate the already reconciled product by filtering Install Status (reconciled). 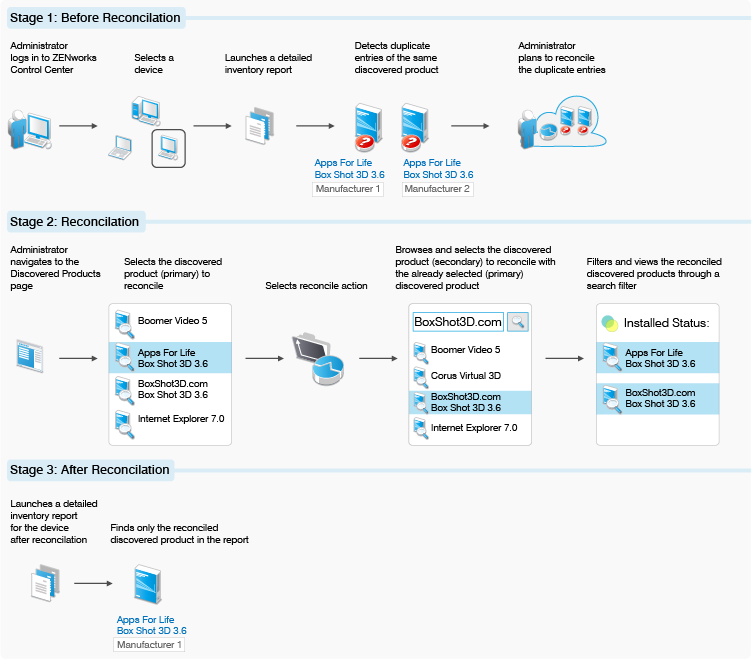 Select the reconciled product (secondary), then click Action > Reconcile Product. A message asking for your confirmation to remove the reconciliation is displayed. Run a full inventory scan of the devices in the Management Zone.